Welcome to our weekly construction/new development roundup where we highlight ongoing work on a handful of NYC projects we may have missed during the week. 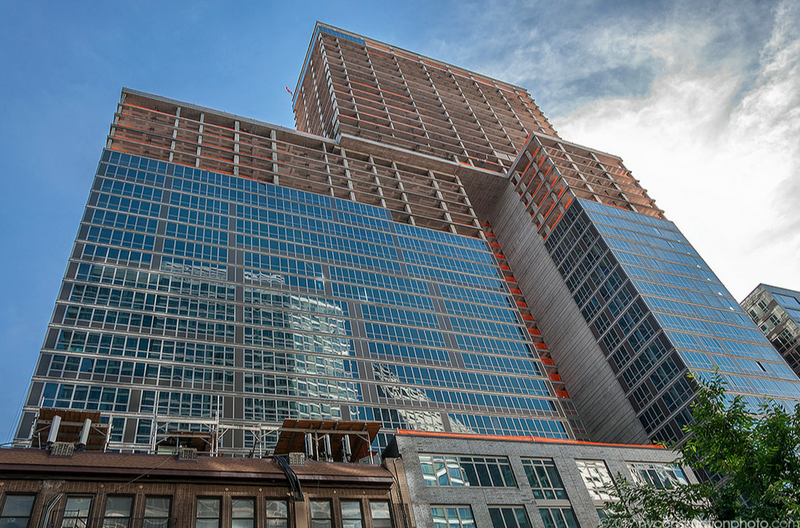 In April this year we got word that TF Cornerstone’s massive Midtown West rental had topped out, and now new construction site photos by NyConstructionPhoto reveal that large portions of development are now clad in their glass facade (with the geometric cutouts). Measuring 1.2 million square feet, this gigantic project will bring 1,028 apartments to the neighborhood, along with 400 parking spots, and 37,000 square feet of retail. If you look close enough you can see its neighbor, Via57 West’s reflection on the facade. JDS and Largo Investments’ Art Deco-inspired condo near the High Line has topped out, new construction photos by Field Condition reveal. Sales on the Roman and Williams-designed residential building got underway in November 2015 with prices starting from $5.2 million. The 10-story building comes with just 14 condos, and all four of the apartments that have been released on the market so far are already in contract. The development was embroiled in a bit of controversy last year when when a neighboring gallery was forced to close due to construction work on the Fitzroy. 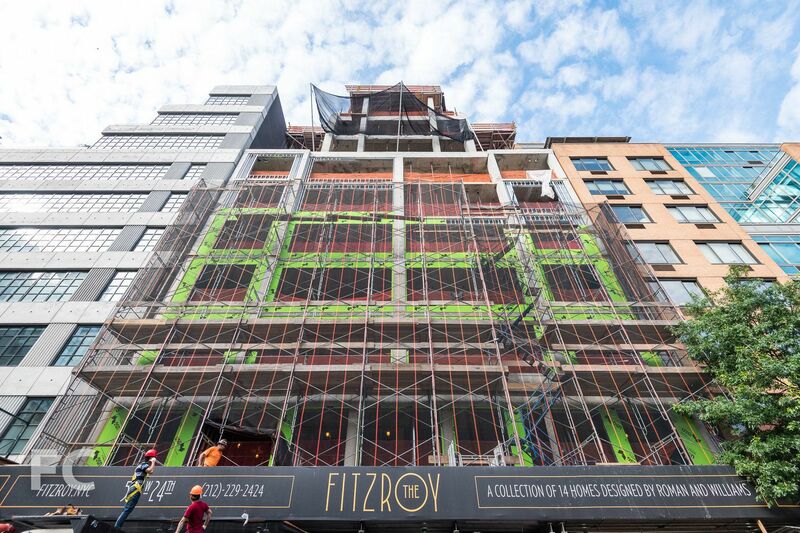 It’s been a little under a year since construction got underway on Fortis’ FiDi condo, One Seaport. Tectonic recently got some shots of the development while on the East River, and the tower is now several floors above ground. Sales on the building’s 80 condos launched in April last year with prices starting from $1.325 million. Dozens of condos here are already in contract, but among the ones available prices range from $1.49 million to $18 million, for one of the condo’s penthouses. 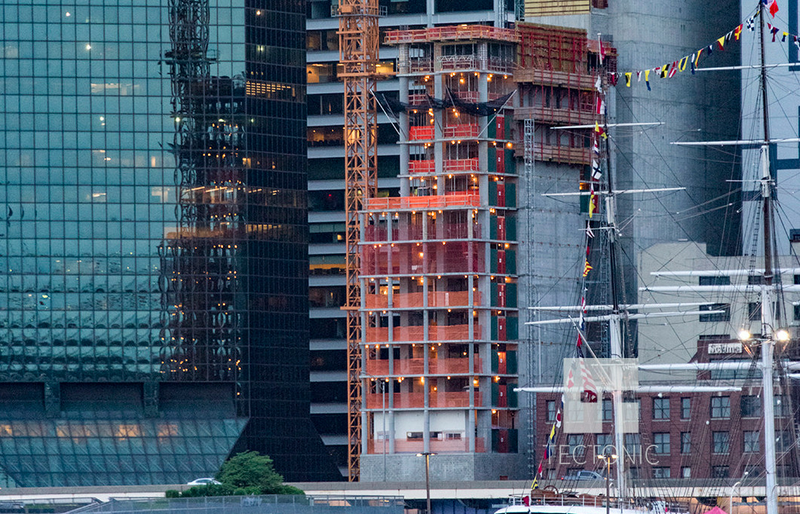 Eventually this building will tower 670 feet over the Financial District.